Gramado is located in the verdant, mountainous Serra Gaúcha region of Rio Grande do Sul, Brazil’s most southern state, an area settled predominantly by German and Italian immigrants in the nineteenth century. Gramado was actually founded by Portuguese immigrants in 1875, but later received German and Italian residents, from the nearby city of Caxias do Sul. By the 1920s, it became a summer holiday resort and to this day continues to be a relaxing and romantic getaway for Brazilians looking to escape the hectic city life of São Paulo or Porto Alegre and some foreign tourists to a lesser extent. Gramado is situated along the touristic route that connects many of the German-influenced towns in the Serra Gaúcha known as the Rota Romantica. I came to Gramado via an overnight bus from Curitiba to Caxias do Sul and then caught another bus to Gramado. Looking out the window at sunrise, it looked like I had left Brazil and landed somewhere in the middle of Pennsylvania. 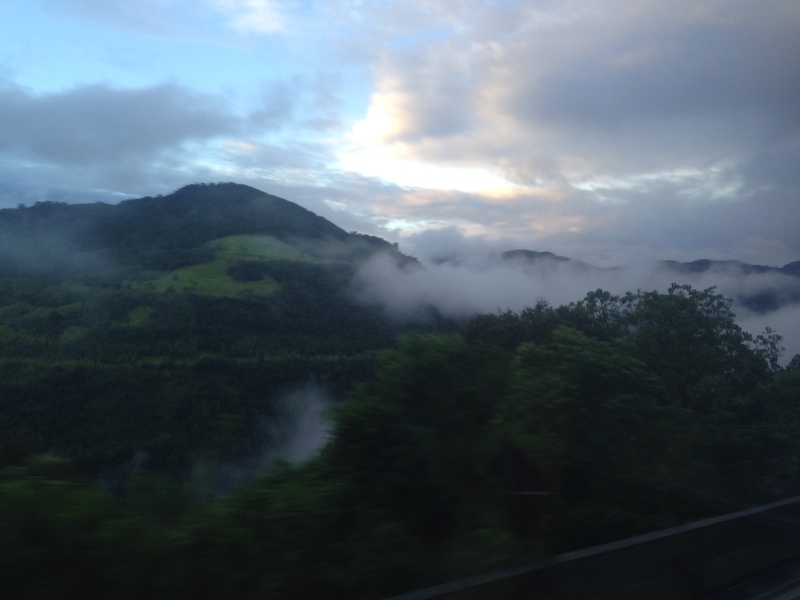 The route takes you through lots of winding mountain roads and breathtaking views. One of the slightly frustrating things about my visit to Gramado (aside from the constant rain the first couple day) was that there was not much information available about the city in English. The guy who worked at Gramado’s central tourist office was very friendly, but spoke only basic English. At the time, my Portuguese was not at a level where I was able to effectively communicate much in the language. However, he was able to get me a tour booked to the Canion Itaimbezinho. I also took a panoramic bus tour of Gramado with Jardineira Das Hortensias, which covered a lot of the city, but unfortunately I was only able to understand bits and pieces of what the tour guide was saying as it was all in Portuguese. From what I gathered, I don’t think Gramado actually gets too many tourists from outside Brazil, so they probably do not see a need to devote much energy to providing information in English or learning the language. One of the more magnificient views in Gramado is the Belvedere Vale do Quilombo, an 850 meter high overlook into a valley along the Avenida das Hortênsias, the road that leads to Canela. 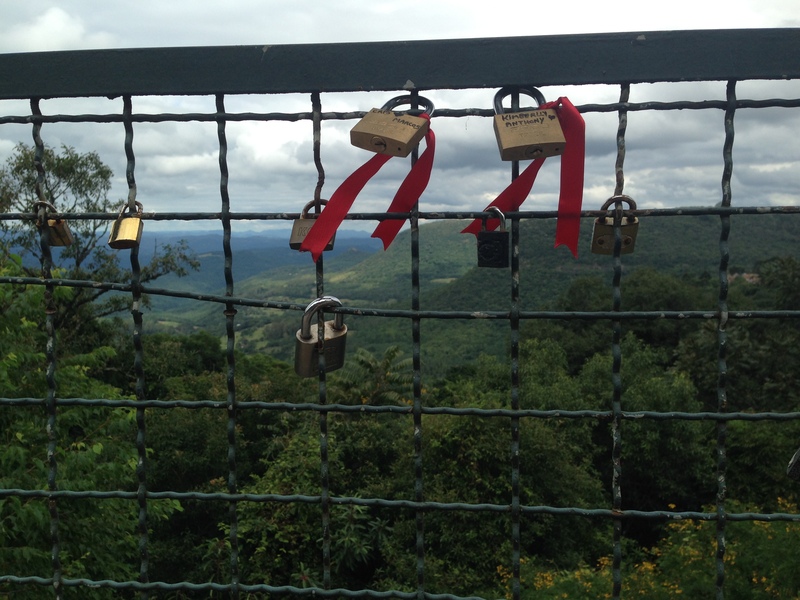 Tradition has it that lovers come here and bring locks to hang on the fence. There is a cheesy looking Christmas theme park (the Aldeai do Papai Noel) nearby too that also offers views of the valley as well. After a forest fire burned down several acres of trees near Gramado, a man named Leopoldo Rosenfeldt decided to construct a lake. He adorned it with trees brought in from Germany’s Black Forest, from which the name of the lake is derived (Black Lake). In the summertime, the walkway around the lake is lined with blue hydrangeas. 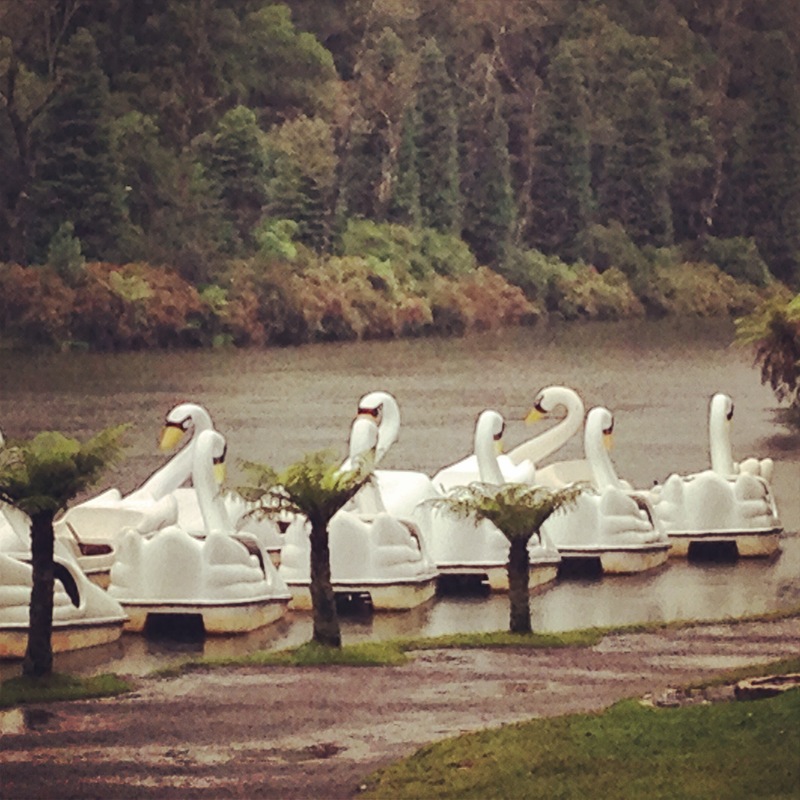 You can also take swan boats out on the water. Nearby shops sell chocolate, wine, cheese and other souvenirs. Unfortunately, the day I visited it was raining, but if the weather were nice this would be another particularly romantic place in Gramado. This church, constructed out of basalt, opened in 1942. The inside is almost Presbyterian in its simplicity and lack of adornment, but has beautiful stained glass windows. On the side of the church is a fountain called the Fonte do Amor Eterno (Fountain of Eternal Love) where, like the Belvedere, lovers leave hearts locked to the rail of the fountain. Gramado is full of romantic fondue restaurants and lots of places serving dishes are clearly meant for two people. I visited Gramado as a solo traveler, so I found this a bit frustrating, but if you’re there with someone special it would be perfect. For breakfast/brunch, many places serve what is called the cafe colonial, a huge array of cakes, cheeses, fruits, juices, jams and more. Again, not ideal if you’re traveling solo. A couple of the restaurants I enjoyed most were Josephina Café (Continental European)and Per Voi (Italian). 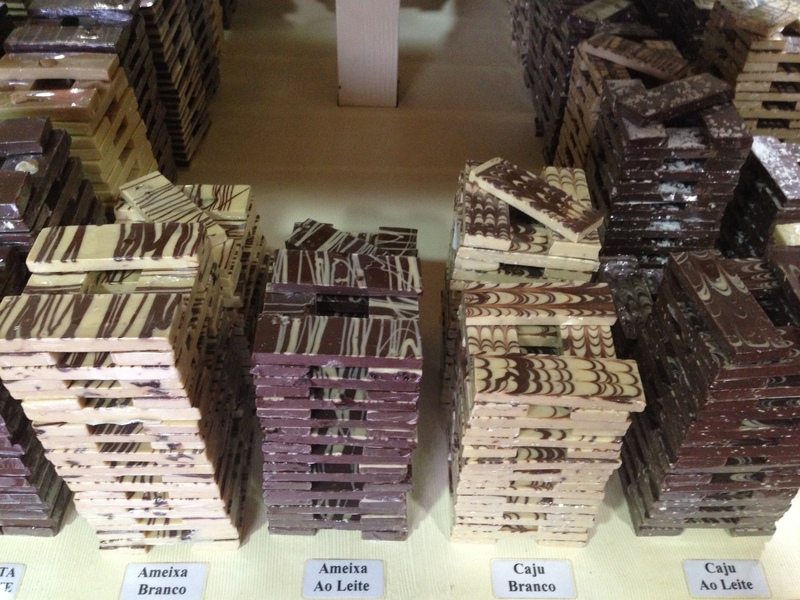 One food item Gramado is famous for that anyone can enjoy is chocolate. Lugano is one of the more famous local brands there and always offers free chocolates in their stores, tempting you to buy some. 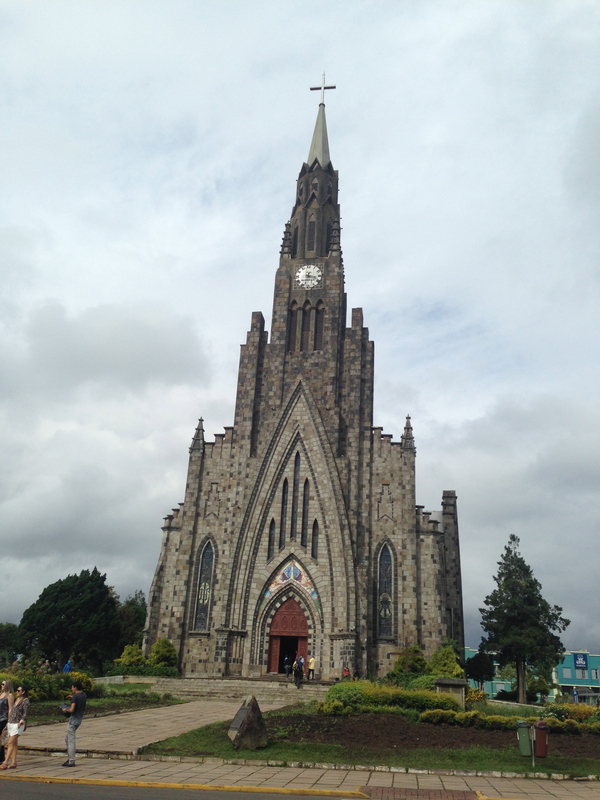 Gramado has a number of other sites that I didn’t see, but that I figure are worth mentioning. There is a theme park called Mini Mundo which displays a miniature replica of a town. Model train enthusiasts would love it. The people on my tour appeared to be raving about it. Gramado also has a place where you can ski or snowboard indoors called Snowland. A popular day trip from Gramado is neighboring Canela, a town with similar heritage, shops, historic buildings, but not quite as swanky as Gramado. I was going to try to visit the Parque do Caracol which has a waterfall (Cascata do Caracol), but I only arrived Canela in the afternoon and didn’t want to pay for a taxi there and back. If you don’t have a car, the best way to get there it to take one of the hop-on, hop-off busses that circulate between Gramado and Canela. One of the highlights of Canela is the magnificent cathedral that towers over the town. It is a Gothic structure made of stone with several beautiful stained glass windows. 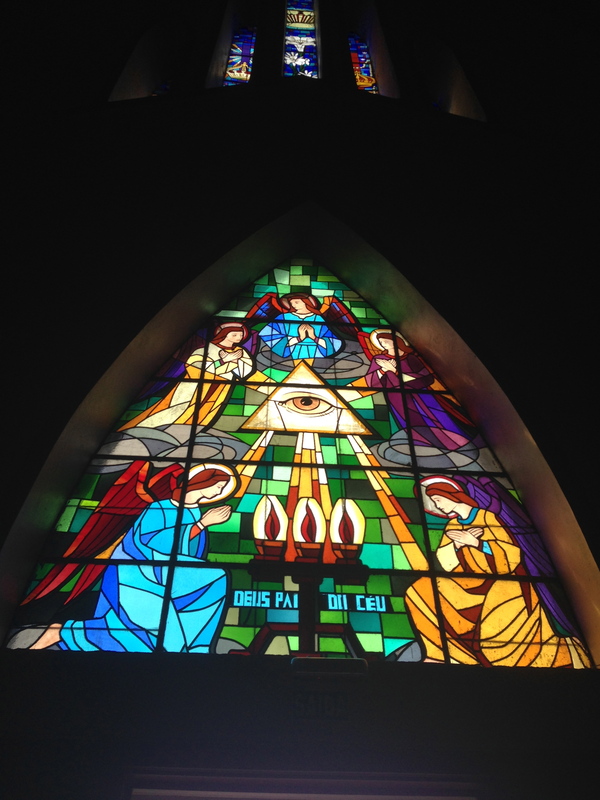 One of the windows has the “Eye of Providence,” the depiction of an eye in a triangle, which many will recognize from the US dollar and its associations with the Masons or even the Illuminati. So far, I have not been able to unearth any information as to why this symbol was used here, whether it is just a rare use of the Eye of Providence or if the Canela cathedral harbors some secret that could be the subject of a Dan Brown novel. Maybe if you visit Canela, you can find out and let us know! I was able to go on an all day tour to the Canion Itaimbezinho, which was definitely a highlight of my time in the Serra Negra. I will be devoting a separate post to it. This park is actually quite a distance from Gramado and best accessed from there on an organized tour. 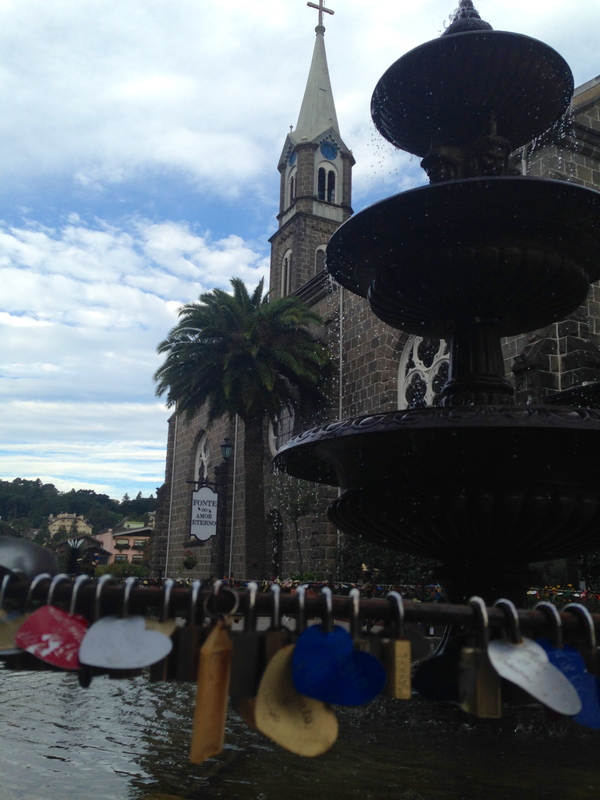 Gramado is truly a beautiful, quaint and romantic place. Solo travelers might feel a bit left out of all the romance though. If I were to visit again, I would most definitely take someone along with me. I wish I had organized my time a bit better and perhaps did more research on tours because not much information was readily available in English. However, a visit here really provided me with a unique experience of European Brazil and the culture of the Serra Gaúcha. Have you visited Gramado or other locations in the Serra Gaúcha? What were your experiences there?